You know when the-zeit asked me to make another guest appearance on their blog I was elated. Some of you who are reading this post might be familiar with my debut feature entitled ‘Maintain positive health in the winter – Let’s do it!’ the response from the-zeit’s readers was simply outstanding. I couldn’t believe so many people enjoyed reading my post and could resonate with it. I love helping people, seriously, I really do, so my objective was to reach out to as many people as possible and hopefully make a positive impact. That post was a tough act to follow; I thought about composing another health article but had a change of heart at the last minute. Since I LOVE to cook and know so many people enjoy eating I decided to treat you all to this Apple kale pomegranate salad – sorry the title is such a mouthful (no pun intended hehe). I believe this recipe is very timely with so many people in what I like to call ‘health mode’. If you’re one of those people, who have made a New Year’s resolutions to eat healthier, then yes I’m referring to you. Salads are very dear to my heart because they’re extremely light, low in fat, carbohydrates and an excellent choice to aid weight loss. 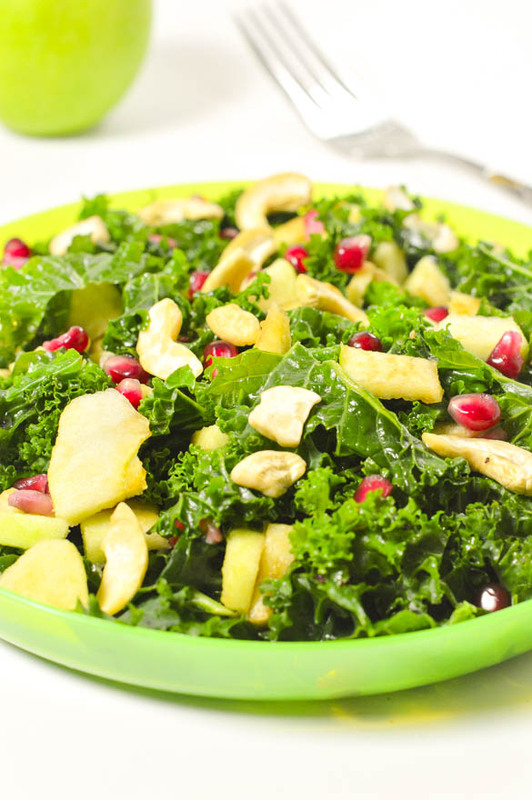 This salad is an assortment of kale, apple, pomegranate seeds and cashews – very simple yet tasty. I know we love to eat but most of us hate how time consuming cooking is and that’s another reason why I created this recipe. It’s one I eat often myself and kept in mind how convenient it was to make when introducing it to the wider audience. This salad contains a host of health benefits, the fats from the cashew help to lower the bad cholesterol (LDL) which reduces the risk of harmful plaques/fatty deposits from building up in the arteries (a condition called atherosclerosis). Make no mistake the cashews have no negative bearing on the remaining low carb ingredients. Instead, they serve as a mode to optimize vitamins and minerals, especially vitamins, B, C, E and K – all of which are vital for our cells to keep us energized, fight free radicals, keep the immune system functioning correctly (not attacking itself), encourage cell rejuvenation, transport oxygen via the circulatory system and create thrombocytes (clotting agent). I know many people enjoy adding a dressing to their salad and that’s fine, but I feel the juices from the pomegranate and apple act as a juicy substitute for the dressing. Don’t underestimate this salad; it’s free from processed ingredients and light on the hips (oh yeah, baby). 1 apple, cored, peeled and diced (add the diced apple to saline water (pink salt water) to prevent from turning brown). 1, Add the kale to a saucepan with some water (about 1/3 cup) and steam the kale for 2-3 minutes with the pan covered. This step is to merely steam the kale and not cook it. 2, Remove the pan from the heat, drain off the excess water and allow to cool for 5 minutes. 3, Next arrange the kale, apple, pomegranates and cashews on a plate. 4, Eat or serve accordingly. I hope you enjoyed this salad as much as I did. Feel free to comment below. 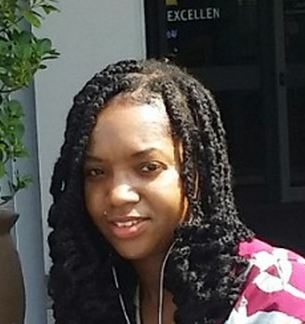 Charlene has a degree in public health and is certified in holistic health. She is passionate about cooking and her mission is to change and empower people to eat wholesome food made from scratch.